It’s almost that time. The end to a 10 week long show in sunny Scottsdale Arizona. The Arizona Fine Art Expo ends next sunday April 3rd. Soon all the artists will be tearing down their booths, packing up and heading in all different directions, to their homes. That means long goodbyes to old and new friends, till next year, when we do this adventure all over again. 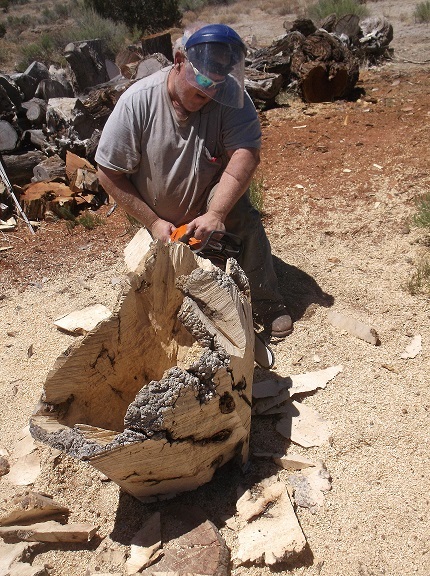 During this years show, Scott was able to create some new and very interesting sculptures. Being with a wide variety of fantastic artists over a 10 week period, allows for some fun collaborations and new ideas. What we take away from being at this show, can’t be found no other place else. Scott and I have lots of plans for some new designs, new techniques and new embellishments with the sculptures. We look forward to seeing how it all works out. Although we’ll miss the friends we have made over the years while going to AZ, we’ll be glad to stay put at home for a while and create for the upcoming summer shows. Here are just a few of the most recent pieces that have been completed at the show. Scott has really been a busy beaver. “Dazzle” is a popular design that has a wavy vase shape. It was carved from Mesquite and has turquoise inlay. 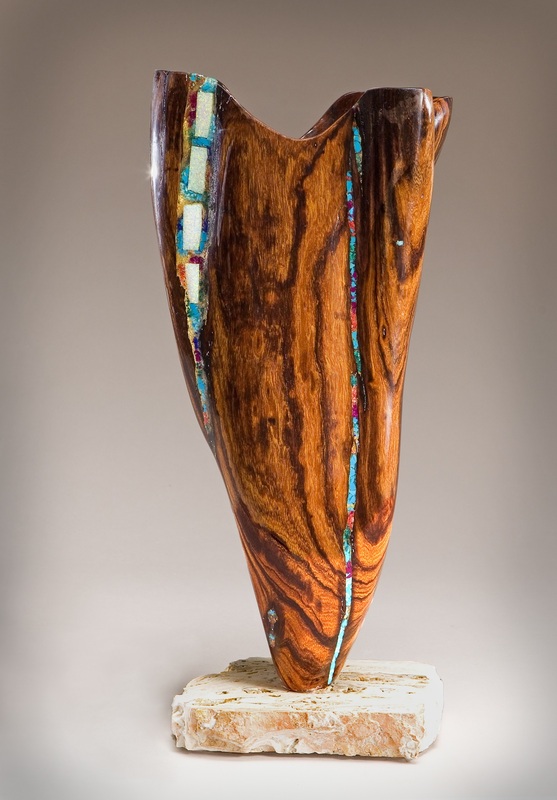 “Two Tunnels” is a tunnel sculpture carved from Alligator Juniper with turquoise inlay. This photo captures a side view looking through the tunnel to the other side. “Three Ways Through” was carved from Pink Alabaster stone into the three tunnels. 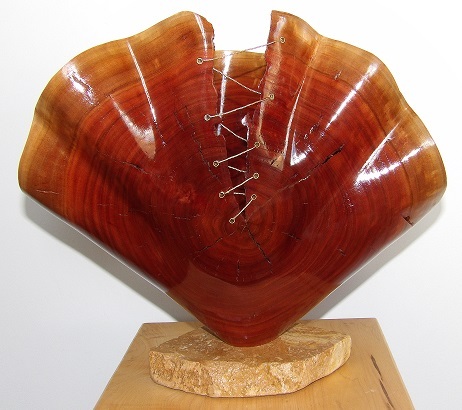 It has Padauk wood attached to the outer rims and used for the base. The stone is fast becoming one of our favorites to carve. Just look at the outcome. “Journey” is a new design we just started creating. 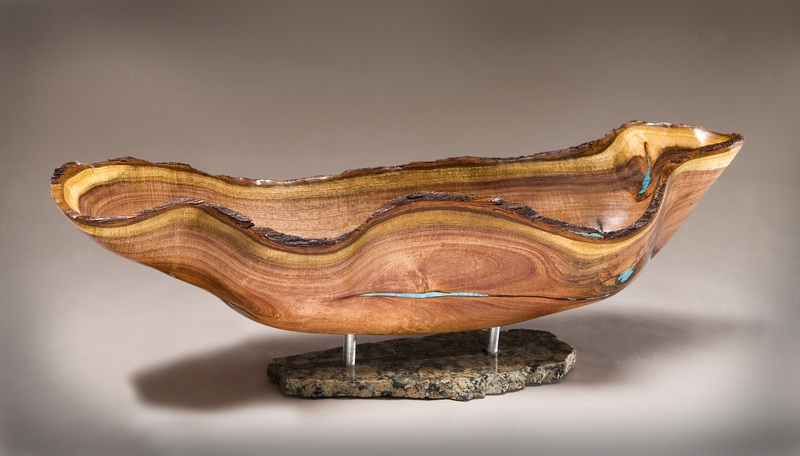 It is made from a mesquite log, into this boat shape, with the bark carefully left in place, and has turquoise inlayed. It seems to be hovering on this stone base, making it a great table center piece. “Mini Entangled” is a smaller version of a 6ft sculpture we made 2 years ago, standing at approximately 32″ tall. This one is much easier to bring around. 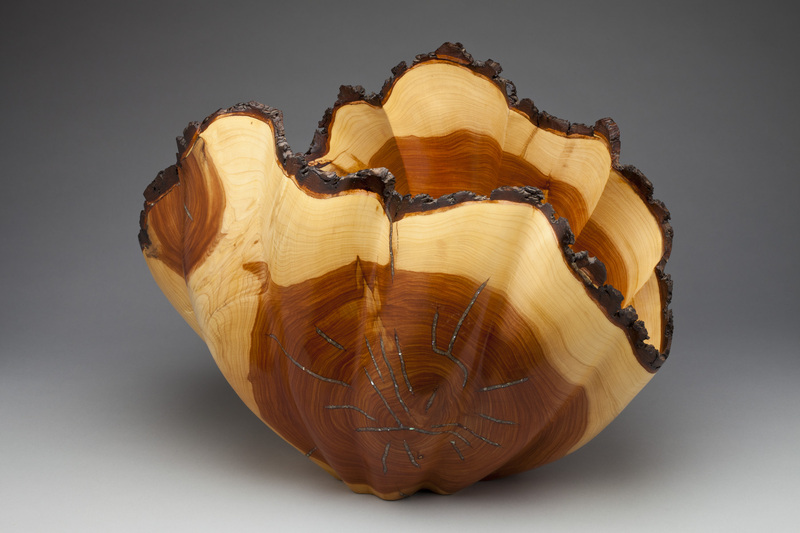 It is carved from mesquite into this spiral shape with a few small tunnels. The bark was carefully left in place, which was no easy task on this one. This sculpture has a lot of motion to it. “See Thru” has been a popular canyon design with the hole going through it. This is the first one that has been carved from Ironwood. 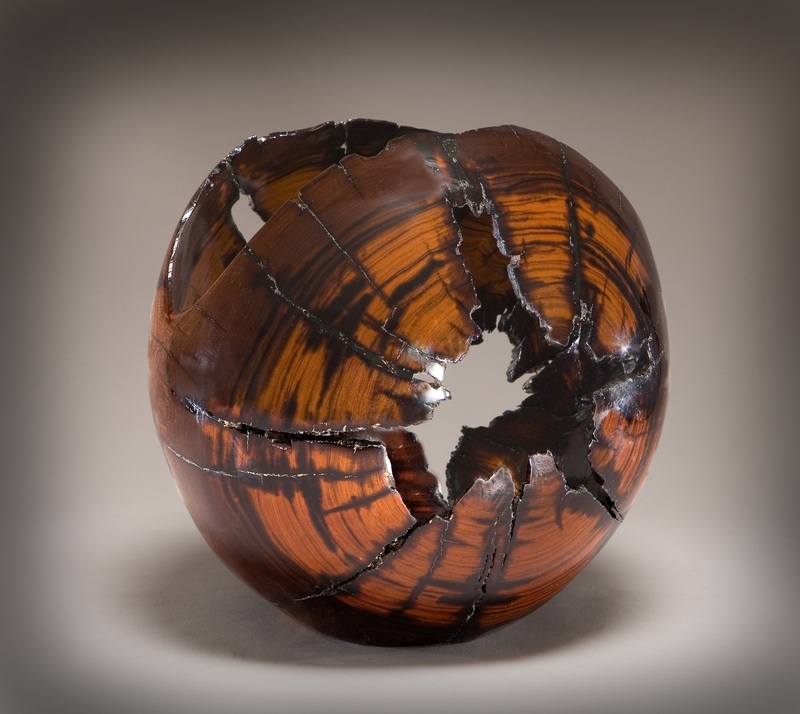 This piece is very dark and with the hole in the middle, is very striking. 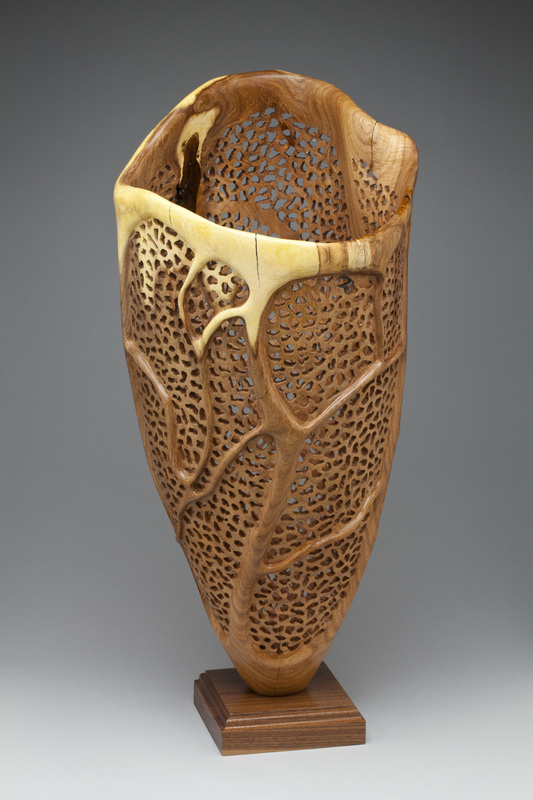 “Stars in your Eyes” is a dainty vase shaped vessel carved from Ironwood. The large cracks allowed for Opal to be inlayed, along with multi stones such as turquoise, coral, malachite, lapis, sugalite, melon and canary. Some of them lay in a bed of Variegated Gold Leaf to make them pop. I love the contrast of the brown to the black in this wood and the multi colored stones really make it sparkle. As artists we create our art not only because we love what we do, but to sell, so someone else can enjoy it. Sometimes there are those special creations that we hold near and dear and are harder to let go of. We’ve had our share of those and every once in a while we may keep one. But most of the time we have to part with a favorite piece, because someone else falls in love with it as much as we did. The newest pieces we just completed were no exception. The finish barely had time to dry before they were out the door and gone. A visit to a new wholesale account proved that attachments can be fleeting. So those new pieces will find wonderful homes and we’ll move on to create more one of a kind sculptures for more people. One such piece to not be around long is this Mesquite Burl Tunnel. The incredible burling of the mesquite is pretty rare and such a find. Scott carved two tunnels on either end with a large opening in the middle. This piece had such natural beauty and so many inclusions, cracks and voids, that we decided to not add any inlay. That was definitely the right choice on this piece. “Dazzle” was one of the pieces just completed. 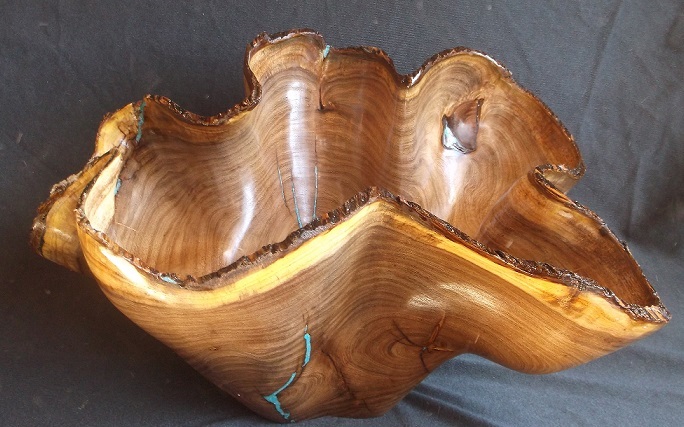 It was a nice wavy vessel carved from Acacia, with the bark carefully left in place and has turquoise inlayed. 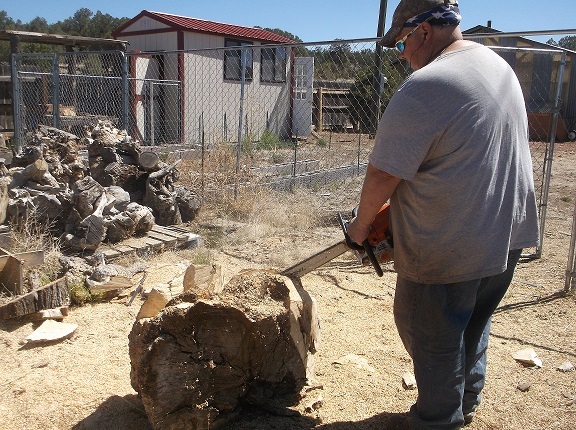 It resembles mesquite in many ways with the yellow sap wood. 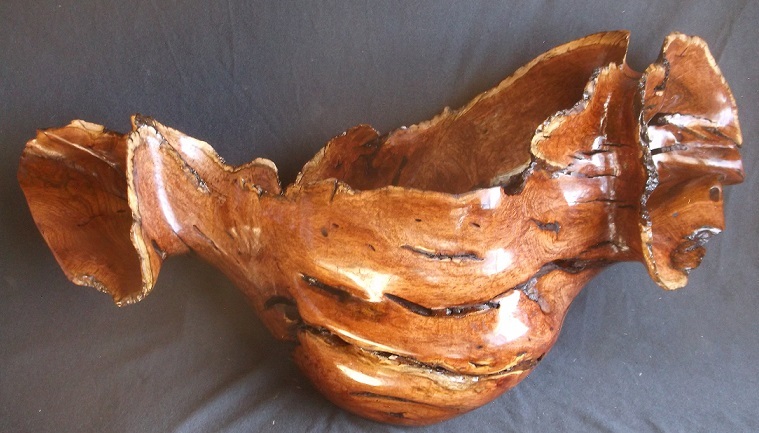 This Tunnel vessel was carved from AZ Ironwood. A long tunnel was carved through the piece and a small bowl shape was carved on the top. Then the large cracks that filled the piece were filled with turquoise. Yes that is the natural color of that wood. It’s incredible. This was just one of the smaller pieces from our new “Topper” designs. We started creating them to reach a larger audience of collectors with small to medium sized vessels. These hollowed out vessels have different features incorporated like, gold leafing, copper or bronze patina and stone inlays. The toppers vary from a stone, gem, geode, rocks and more. This one was carved from Mesquite, has turquoise inlayed and the hand made topper has a turquoise rock on it. We have fun with these pieces, adding some kind of unique artistic touch. 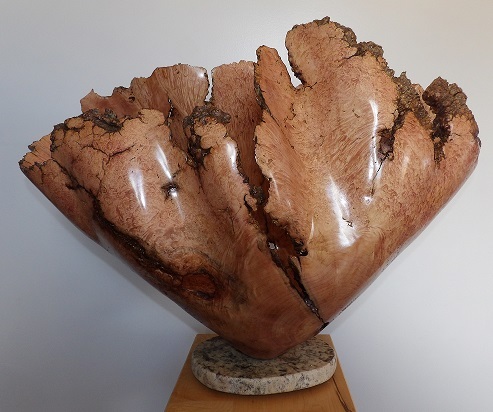 Some of you, from Face Book, might remember this Oak Burl in the beginning stage, when we were getting your opinion on whether to load it with turquoise or just slightly add it. Well I went in between and did a fair amount of turquoise, but didn’t totally load it. I think the finished piece speaks for itself. It’s GORGEOUS. We’ll be working on creating some very exciting sculptures in various sizes, along with a good assortment of small to medium vessels over the next two months. I’m sure time will fly by before leaving for AZ, so there are no plans to do anything, but work work work. The Alabaster Stone in large 90# blocks, ready for something creative to take place and reveal the beauty within. Recently we started carving Alabaster stone. We’ve been wanting to try it out for some time. Although it can be carved and sanded with the same tools, it has proven to be more challenging and quite a bit messier. Just like “Pig Pen” from the Peanuts cartoon, a white cloud follows us when we work with it. 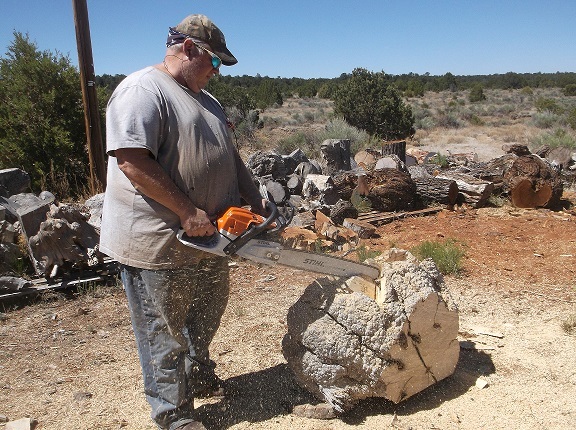 Scott has found that he unfortunately can’t use the chainsaw on it, due to the aggressive nature of it because the stone will break apart much easier. So it takes longer to use the grinders to carve intricate designs. And due to the hairline cracks that may exist in the stone, he has to be careful during the carving process or the whole piece will just crack wide open. We are enjoying the new medium and the different element it allows us to show. Scott’s creative juices can really flow and grow carving the stone. The color variations in the Alabaster is incredible. 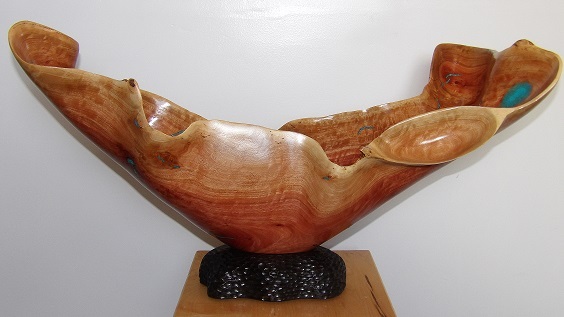 The above bowl was made from the Pink Alabaster and has Ebony wood on the rim. This was one of the first pieces Scott carved. He created some curves and gentle waves to bring out the beautiful colors. The Ebony wood rim adds an incredible contrast between the colors. This piece was one of the most recent created. It is a Grey Alabaster. The stone was odd shaped, so this canyon shape was created. The grey stone has a different array of colors going through, like, green, tan, white and grey. This was also carved from a small piece of the Grey Alabaster and has Purple Heart on the rim. 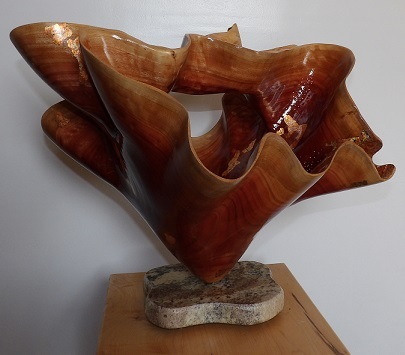 This beauty was carved from a large block of the Red Alabaster and has Bubinga wood attached to the tunnel openings and used for the base. Three tunnels were carved out of the stone creating this incredible sculpture. The red of the Bubinga shows off all the red tones in the stones. You have to see this piece in person to really appreciate how beautiful it is. Things have been moving along here at the Celebration of Fine Art Show in Scottsdale. We only have 4 weeks left. The weather has been a bit wacky, but the patrons are still coming out in good numbers. We are really enjoying ourselves and making great new friends here. We miss some of our friends from last years show, but we get together from time to time to catch up and share a few good laughs. The artists and promoters at Celebration are so friendly, professional and hard working and the artwork is incredible. This gallery setting show is like no other in the country and has some of the best artists around. A shot of our booth. We also have a workspace outside where we can work on new pieces. We’ve already created many new pieces while here. 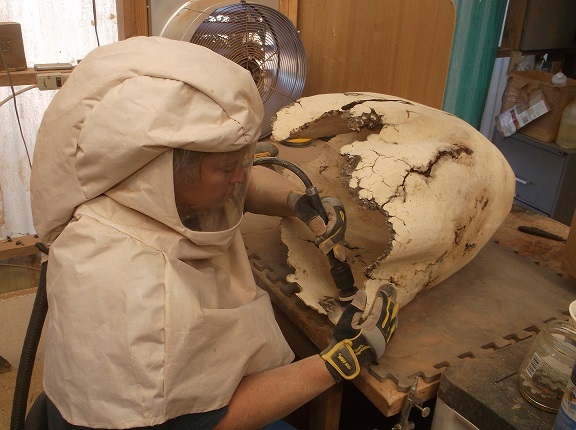 Below Scott is working on a four tunnel vessel made from Mesquite Burl. Here is “4 Tunnels Through” complete. It is gorgeous. “Rejoice” was made from Ironwood. This is a beauty. 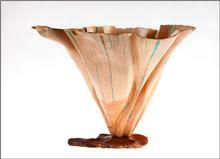 It stands about 20″ tall with the copper base and 15″ wide. The wood is so dense and hard to work with, but has incredible color in it. And the turquoise really stands out on it as well. 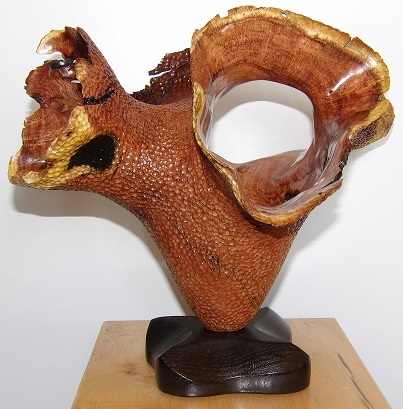 “Root of Delight” was carved from an Alligator Juniper Burl. Scott incorporated the root section into the carving and I inlayed turquoise into all the very fine cracks that exhisted all over this piece. “Iron Dancer” is a piece we finished before the show. It inspired a painter, Maia Leisz, here at the show to paint it and it turned out fabulous. She has painted a few of our pieces. Here is Maia Leisz painting a collaborative piece with several artists works, including one of ours. She had so much fun with this. She is the happiest, most bubbly person at the show. I tell her she’s infectious. And that’s a good thing. This is potter Joe Woodford taking a piece out of the kiln and doing his Rakuu method. It is amazing to watch him do the process. He puts a firemens outfit on, uses these huge tongs and carries a piece to a pit, where he then covers it with a can, stuffs newspaper in a hole and kicks dirt around to smother all the air. You have to watch this process to fully appreciate it. Even though we are extremely busy here at the show, we’re having fun, meeting new customers and making great friends. We’re creating some wonderful new designs and thinking of other things to do for when we come back next year. It’s a long 10 weeks, but we wouldn’t trade it for anything. 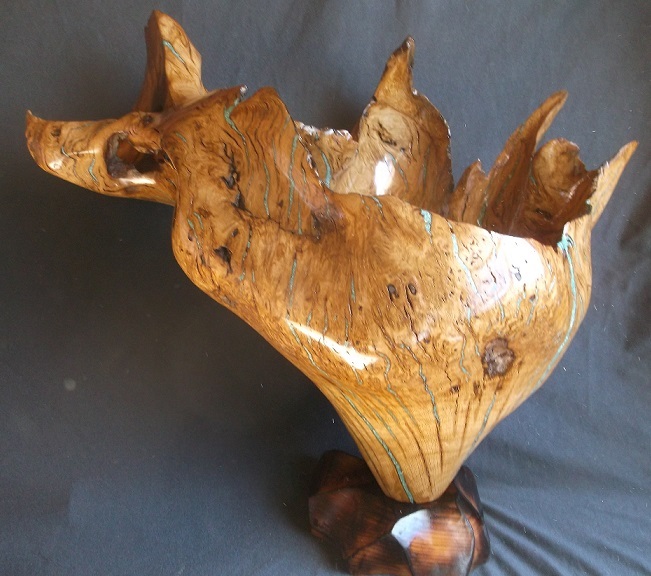 “ENTANGLED” was made from a 7ft Elm Log that Scott picked up in Ruidoso. 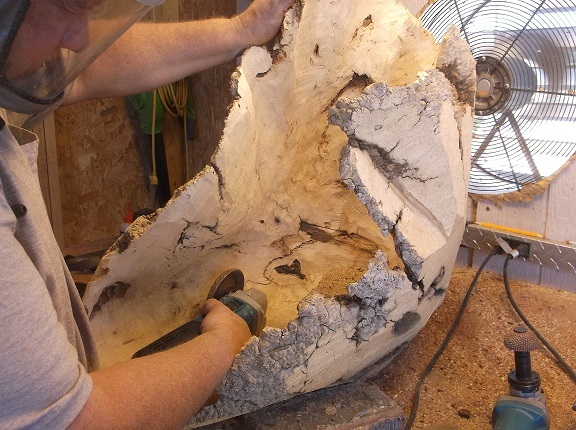 The diameter was about 22″ round and it was quite a piece to work on. It was still green and that enabled Scott to be able to leave the bark on. 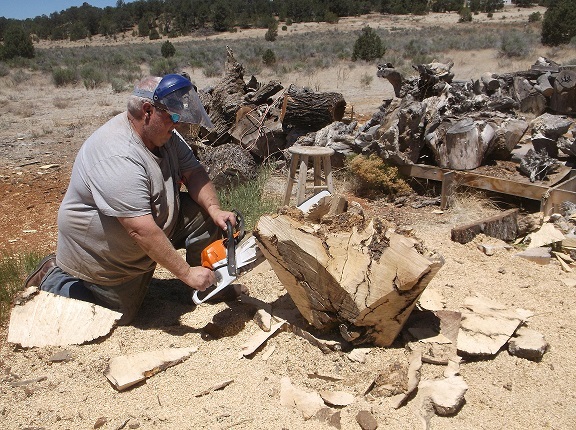 He had to be very careful carving it to make sure the bark was left intact and to not go through the piece. Lots of super glue was used on the bark to secure it as well. The sculpture resembles two entities that are entangled or entwined together. You can see the two round parts that are at either end and the bodies encircle the piece. The color contrast that goes between the bark, the blonde sap wood and the brown tones of the inner log are a beautiful combination. The base was made from apple. This picture shows how the bodies curve around the piece. 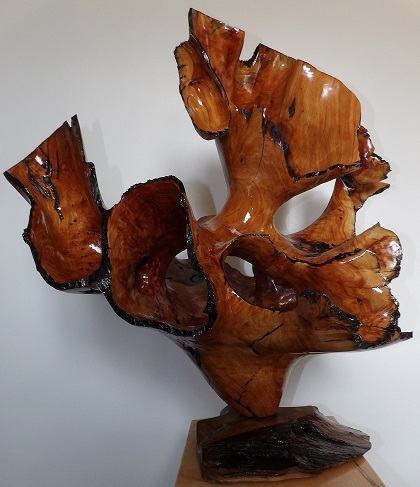 This truly is a magnificent piece and would look great in a front entry of an office or home. It definately gets the attention. 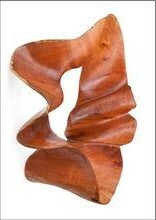 “IRON DANCER” is made from Ironwood. This wood definately earns its name. It’s very hard to work with. We go through chains, grinder wheels and sandpaper like crazy when we work with this wood. But it is magnificent. The color variations are just incredible. 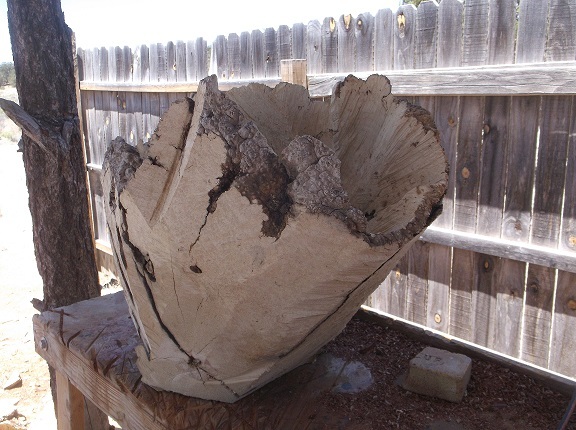 This piece was carved from a root section and Scott incorporated that into the design. Since it had so many voids and cracks, I just loaded it with large chunks of turquoise all over it. This sculpture has a very dramatic appearance and would make a statement no matter where it is placed. This side shows a large portion of turquoise that was inlayed. This is the inside of “Iron Dancer”. Lots of turquoise there as well. “CANYON ARCHES” is my favorite. 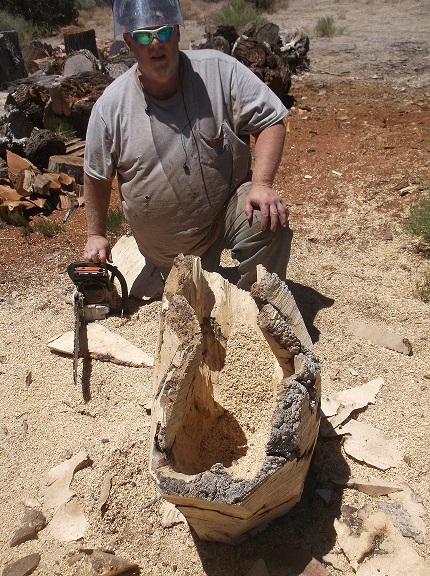 Scott carved three tunnels into this Juniper log and got this interesting design. Every side has a different view into the middle. It was quite hard to sand and apply finish because of this design, but WOW did it turn out beautiful. The old growth juniper really took on a deep orange color and is so rich. This pictures shows another view inside the piece and a bit more turquoise inlay. “VAN GOUGHS EAR”. Ok the name is funny, but it realy does look like an ear. Now if I had a little Jack Russel to place next to it, looking inside, I’d have a whole different look. 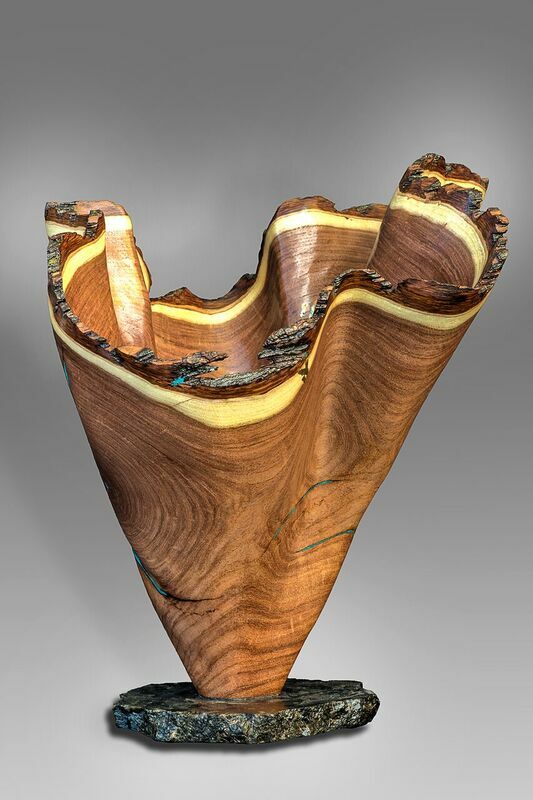 This whimsical sculpture is made from mesquite. The log was odd shaped and Scott was unsure what to do with it. So, whala, it’s now an ear. It perches on a tiger maple base and has turquoise inlay. 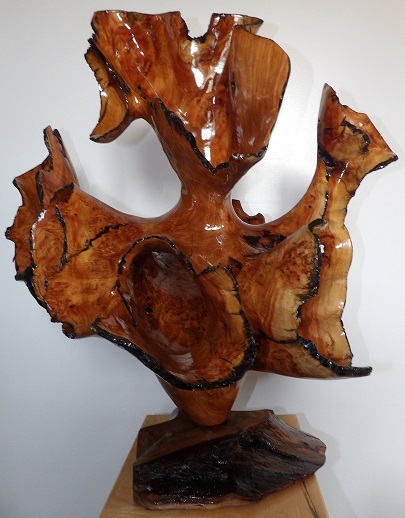 “FLAMINGO DANCER” is made from Alligator Juniper Burl. I love the dramatic effect of the skirt part that flows down. 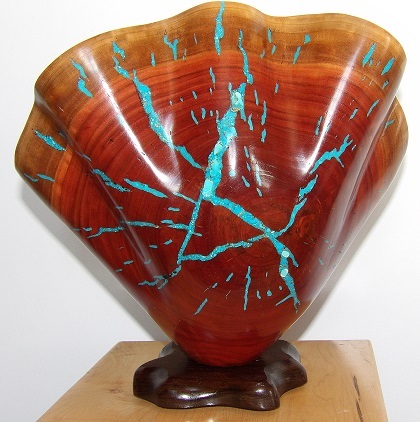 I was able to load that area with turquoise, and it really pops against the burl. There are three feet carved into this sculpture and the carved ruffles of the skirt are quite striking. This photo shows off all the turquoise and carving in what I call “the skirt”. Look at the beautiful burl. 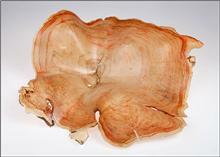 “SATIN SHEETS” is a wall piece made from gorgeous Maple Burl and well, it looks like satin sheets. 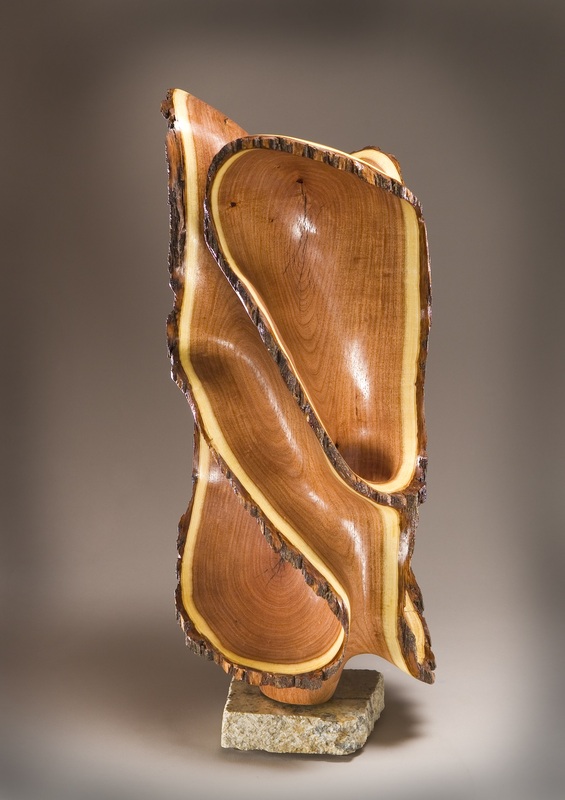 Scott carved gentle waves and folds on this piece to show off the burl. It’s really incredible to see up close and would look great on a wall. 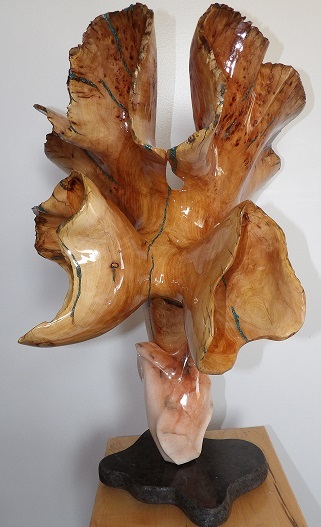 This wall piece was also made from a Maple Burl. Scott carved slight ridges into the piece and we then inlayed some petrified wood and turquoise into it. The picture doesn’t show how pretty this piece is. The petrified wood is a nice touch and adds more character to the wall sculpture. 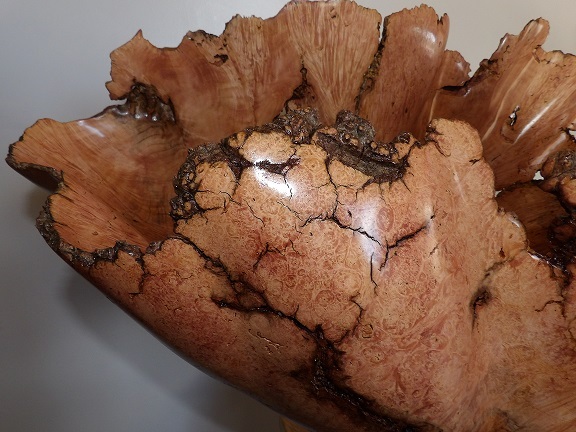 Last but not least for this blog is this incredible giant platter made from old growth black walnut burl. The figure in this platter is so beautiful and is set off even more with the turquoise that was inlayed in about ever crack and crevice I could find. 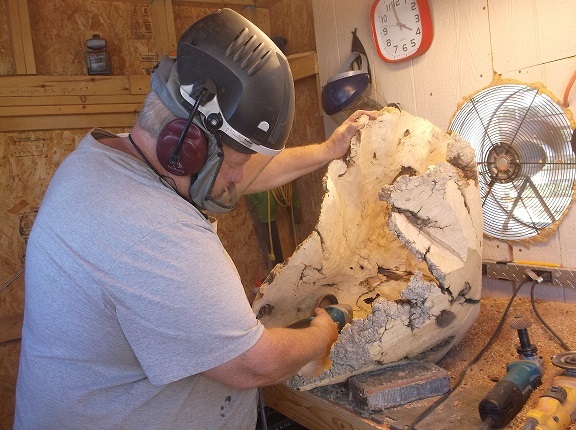 This is the last part of a large walnut burl that we had and I wish we had more. The figure is just like not other. I just might have to talk Scott into keeping this one, since we can’t get more. “Holy Grail” is a great name for this piece. Originally we named it “Pierced”. Kind of blaw, but naming things isn’t our strong suit. So an artist friend saw this at it’s first appearance in Santa Monica CA and said this is the Holy Grail. And it’s because of him that we changed the name on this piece. 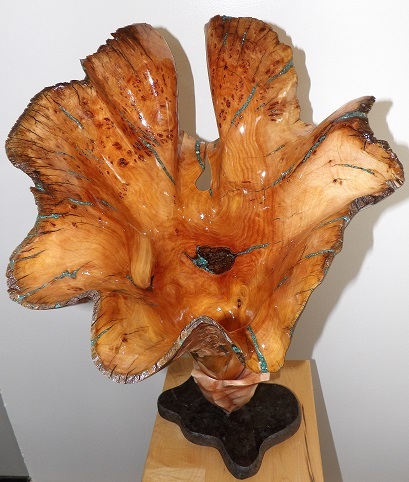 It is made from Mesquite and stands 33″ tall and has a diamter of 14″. The mesquite log it was made from had a little rotted area that we filled in with black epoxy and some beautiful yellow sap wood that you can see in this picture. In an older post I had some construction photos of Scott working on this piece. Boy did it take a lot longer than expected to create this. Drilling and then shaping all those holes was very time consuming. I started calling him the Holy Man, because that is all he did, was make holes all day. This piece came out spectacular. Being our first sculpture to pierce (Scott just had to do something large the first time), I have to admit I’m going to have a hard time parting with this one. Every time I look at it, I’m amazed. It got a lot of attention at the show in CA and many praises. I don’t expect we’ll have it much longer. This vessel was created a few months ago, but we wanted professional photos of it. It looks much better in this photo and shows off the clam shape that Scott created, along with the inlayed Abalone shell. He was careful to leave the bark on, which is very hard. This is a great piece and isn’t to large at only 18x12x9. We are in the process of creating several new pieces right now for upcoming shows. So stay tuned for what Scott comes up with next. There are some really cools designs in the works. Finally got “Twister” to our photograph and it was worth it. His photos are so much better than ours. Here are a few new carved vessels and sculpture pieces that we just completed. 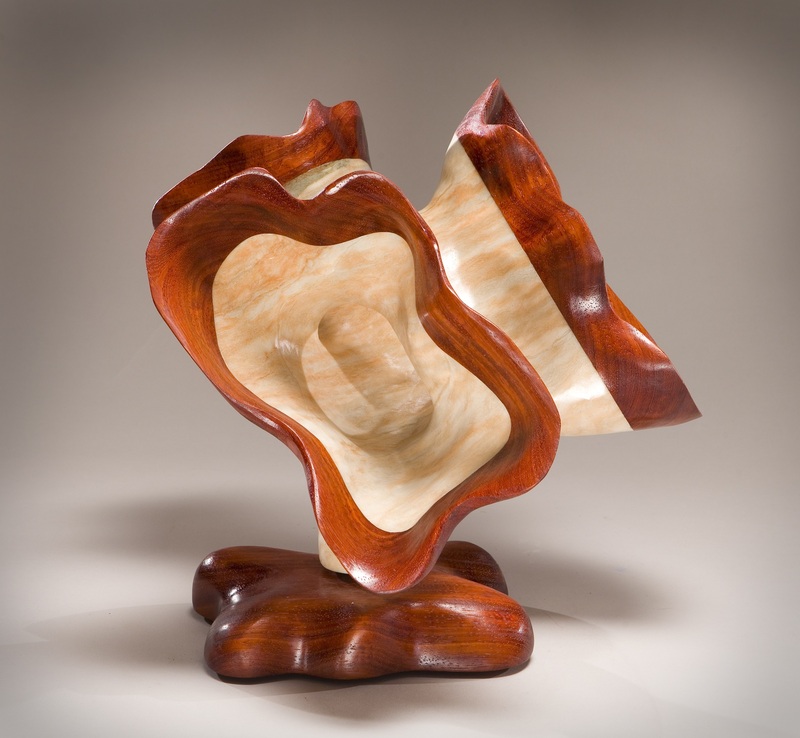 “ASTAIRE” This juniper carved vessel was named after Fred Astaire because the way Scott carved the feet and all the waves and folds makes it look like its dancing. This is a nice size piece at approximately 20″ diameter and 12″ tall. “PRETTY IN PINK” Yes I’m a BIG fan of the cult film from the 80’s. But this piece really is pink. 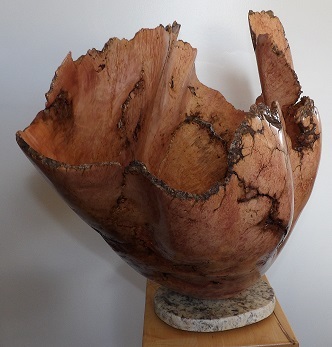 Made from Box Elder Burl, it had so much pink in it, that it earned the name. Scott made this piece simple, since it is so striking. It is approximately 36″ diameter and can hang on the wall or prop on a table. 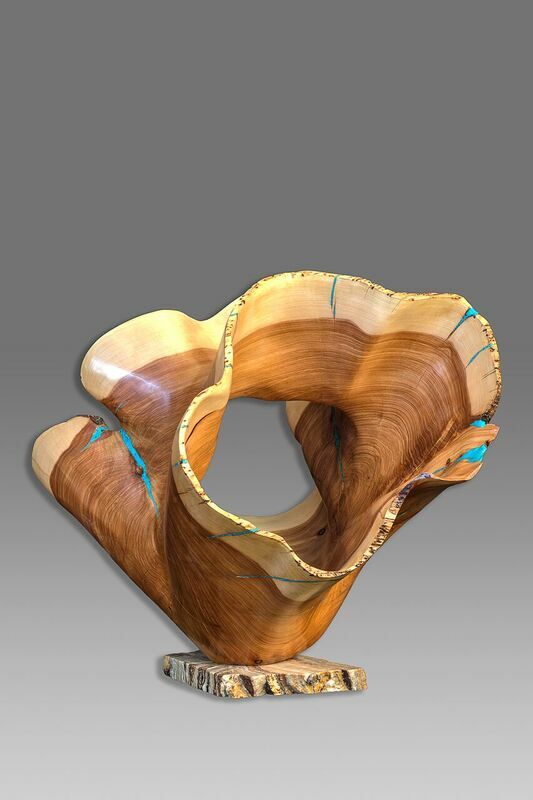 “GALAXY” This piece was carved out of mesquite. A friend had a large piece that was rotted in the middle and he couldn’t use it for anything. So Scott and his imagination came up with this that got rid of all the rot. This piece is full of twists and turns and reminded us of what the galaxy might look like. It is approximately 24″ Tall, 18″ wide and 5″ deep. These are now our simpler carved bowls. We got away from doing the plain round bowls but wanted to have a more reasonable art item with still some artistic appeal to it. 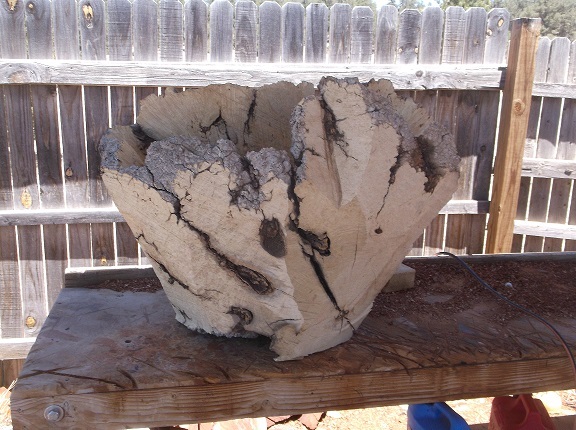 These are made from mesquite with the yellow sap wood and bark left on. They all vary in size and shape and come with or without turquoise. “LILLY OF THE VALLEY” We posted this piece before but finally had a professional photo done of it. It looks much better. 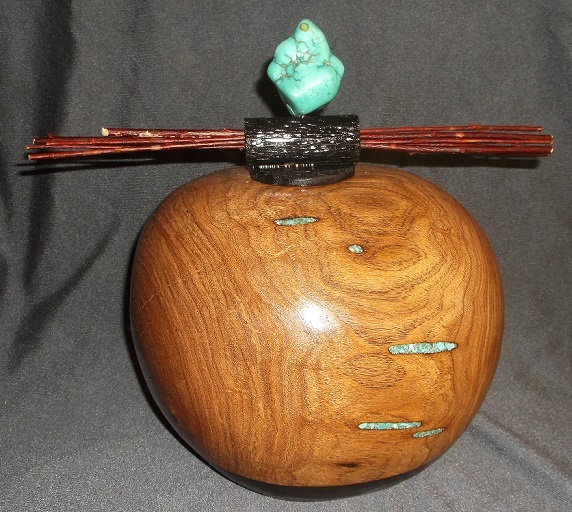 Made from Juniper with turquoise inlay and a cherry burl vase. You are currently browsing the archives for the New Carved Vessel category.